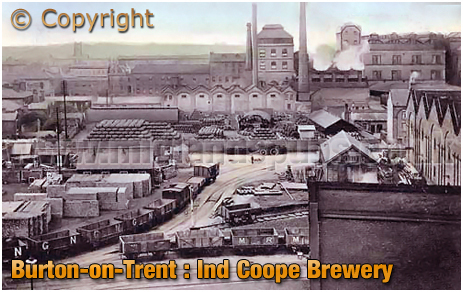 History and Information on Ind Coope Ltd. of Burton-on-Trent in the county of Staffordshire. 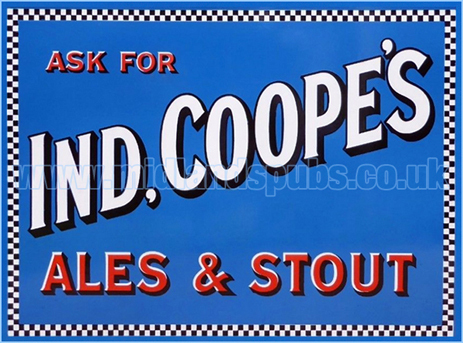 www.midlandspubs.co.uk | Breweries | Staffordshire | Ind Coope Ltd. 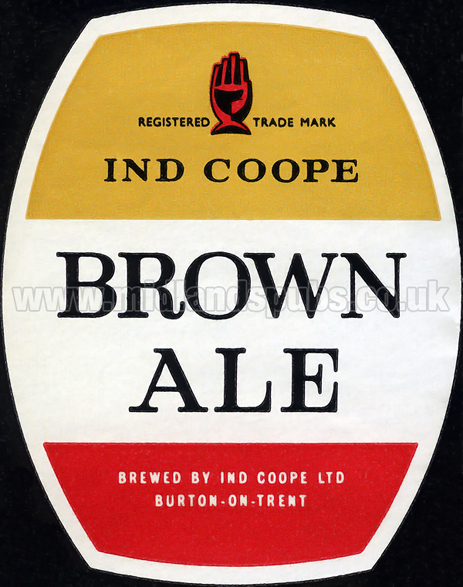 Though not strictly a Midlands brewery, Ind Coope has to be included because of its association with Burton-on-Trent. The image below shows the company's brewery and maltings that stood next to the main railway lines close to the railway station. 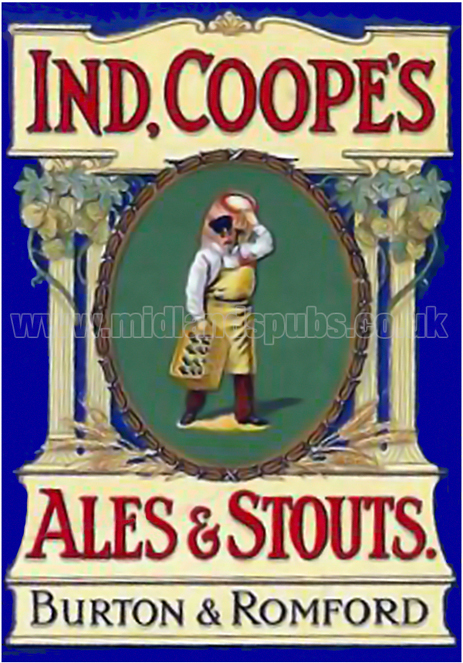 Ind Coope initially owned the Star Brewery that was founded by George Cardon in 1709 at Romford, Essex. 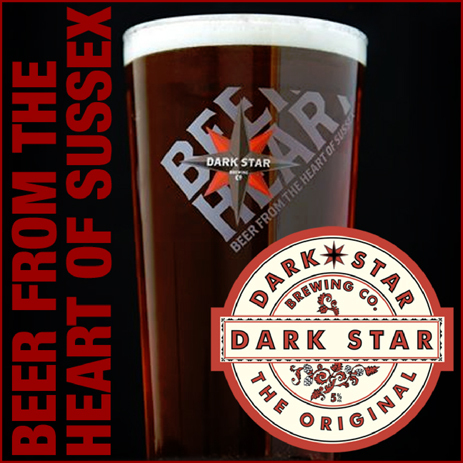 The original brewery was located to the rear of the Star Inn situated on the town's High Street. Following the death of George Cardon, the inn and brewery was acquired by Edward Ind and J. Grosvenor in 1799. The son of James Ind, a Hertfordshire maltster, Edward Ind was born in Ashwell in 1779. There was a change in the trading name in 1816 when Grosvenor sold his interest in the brewery to John Smith and the firm became known as Ind and Smith. Edward Ind married twice and there were eight children. It was Edward Ind, born in 1829 to Edward senior's second wife Elizabeth Flower, who took control of the firm following his father's death in 1845. This was the year in which John Smith sold his interest in the business to members of the Coope family. Octavius Coope would later become a Member of Parliament. O. E. Coope joined the firm and became a key figure in the company. Edward Ind, son of the company's founder, married Elizabeth Terrey at Lewisham in 1852 and they established a family at Combe Green, Cranham. By the mid-1850s the business was known as Ind Coope and Company. They opened a brewery in Burton-on-Trent in 1856. Indeed, that was the first instance of an Essex brewer opening an establishment in Burton to take advantage of the Staffordshire town's famed water. Part of their 19th century brewery still stands, including the water tower. The large advertisement above shows the brewery in full splendour. There is a Victorian description of Ind Coope's brewery in the second volume of "Noted Breweries of Great Britain and Ireland, Vol. 2." in which Alfred Barnard wrote in 1889: "The brewery at Burton, the property of Messrs. Ind and Coope, Limited, of Romford and Burton, was acquired in the year 1856, when it had only been partially erected, by a Mr. Middleton, from one of the large breweries in the town. 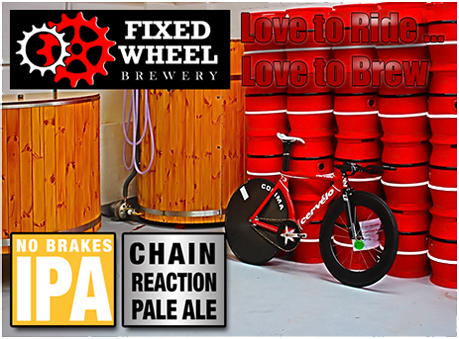 On taking possession, they immediately completed the buildings, and fitted up the brewery in a modern style. 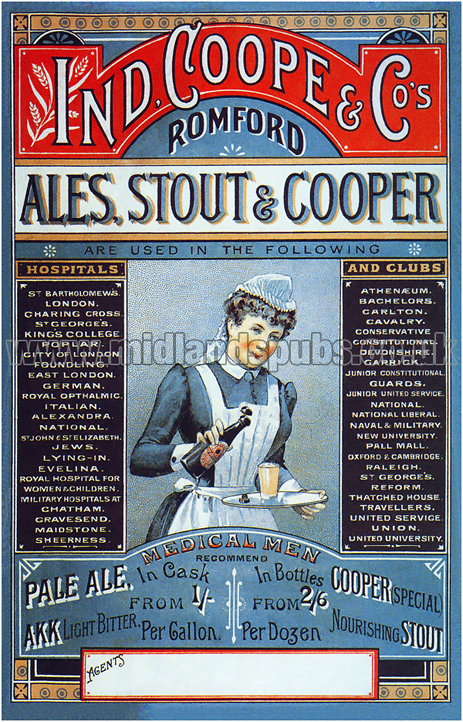 This was the first instance of what may be termed a London firm opening an establishment in the famous town of Burton; for then, as now, Messrs. Ind and Coope carried on an extensive brewery business at Romford, near London, which will be described hereafter. 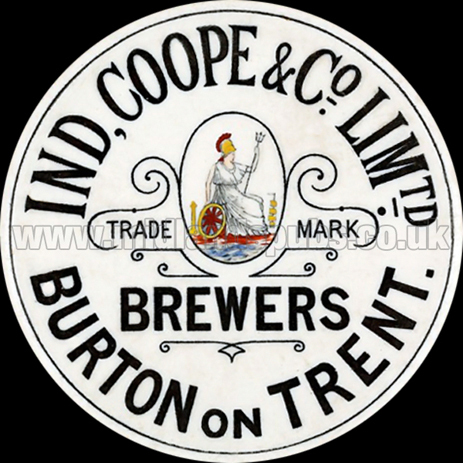 So rapid was the progress of the business under able management, that in a few years Messrs. Ind and Coope attained the position of the third largest brewers in Burton. The premises, which are close to the railway station, and adjoin those of Messrs. Messrs. Allsopp and Sons Limited, and others, cover upwards of twenty-three acres, and are everywhere intersected by private lines in connection with the Midland system. They are grouped together in three sections, the brewery itself being on the north side of Station Street, the stores and cooperage on the south side, and the maltings on the west side of the railway station. From any point of view the brewery has an imposing appearance, as will be seen from our illustrations. The buildings, which are constructed of red brick, and most substantially built, are of lofty elevation, and are fitted up with every modern appliance and machine known to the trade." 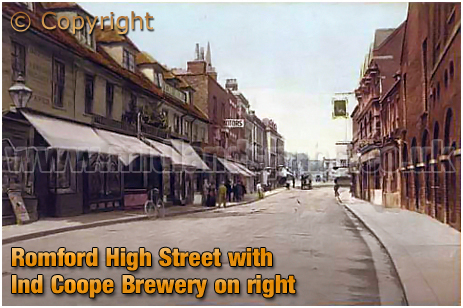 The company also enlarged the Romford brewery during the 19th century. Romford High Street is pictured here in an image dating from around 1906. The Star Brewery can be seen to the right of the picture. 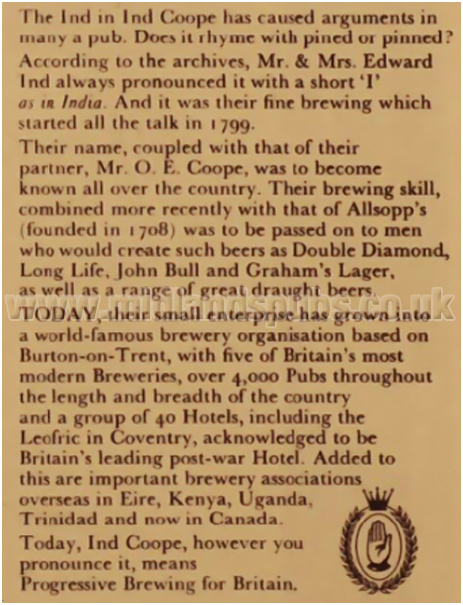 Ind Coope was registered as a private limited company in 1886, before going public four years later. In 1900 the firm acquired the Brentwood Brewery of Jeremiah Hill and Company, adding 31 public houses to the tied estate of Ind Coope. Trading during the Edwardian period proved to be extremely difficult and the company went into receivership with a re-structuring programme that salvaged the business. Fortunes were turned around and the new company started to acquire other breweries. Bindley and Co. and Robinson's were two Burton enterprises that were bought out in 1914 and 1920 respectively. In 1923 Woolf's of Crewe were snapped up, along with 42 public houses. A more substantial number of outlets were added to the portfolio when the company acquired the Colchester Brewing Co. Ltd. in 1925. 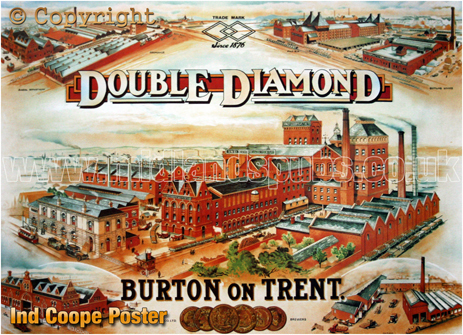 Back in Burton-on-Trent the Burton Brewery Co. Ltd. was scooped up in 1927 which brought another 75 tied houses under the Ind Coope banner. The acquistion of other breweries continued and, in 1929, the company bought the All Saints' Brewery of Leicester, along with 81 public houses. 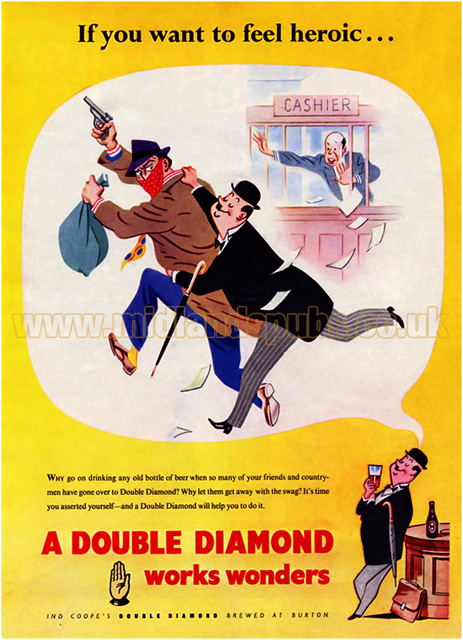 Two years later more than sixty public houses were taken over when Budden and Biggs of Strood were acquired. Ind Coope had an insatiable appetite for buying out smaller enterprises and no sooner had the ink dried on the Budden and Biggs deal, they took over the Leeds City Brewery. With the number of small-to-medium breweries shrinking Ind Coope went after one of the bigger competitors. In 1934 it was announced that the company was to merge with Samuel Allsopp and Sons Ltd., though it was more of a takeover in reality. Not only did this bring a considerable number of outlets, the fact that Allsopp's were their next door neighbours at Burton-on-Trent, meant that massive savings with economies of scale could be achieved. The new business traded as Ind Coope and Allsopp Ltd. Following the Second World War, Ind Coope and Allsopp Ltd. resumed a programme of acquisitions and takeovers. In 1948 the company purchased Parker's Burslem Brewery Co. Ltd., resulting in the takeover of 468 public houses. During the following year the Wrexham Lager Beer Co. Ltd. was acquired. Another 129 tied houses were mopped up in 1950 during the acquisition of Lonsdale and Adshead Ltd. of Macclesfield. Smaller firms did not escape the company's attention and Shrewsbury's Trouncer and Co. Ltd. fell victim to a takeover in 1956. 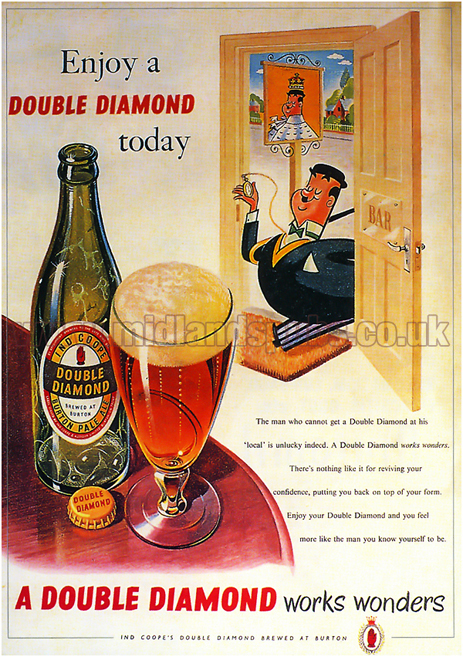 However, it was the acquisition of Benskin's Watford Brewery Ltd. in 1957 that really shook the licensed trade. In this deal the company took control of 636 public houses. The East London firm of Taylor Walker and Co. Ltd. was taken over two years later, a year when the Alllsopp name disappered from the company's title. 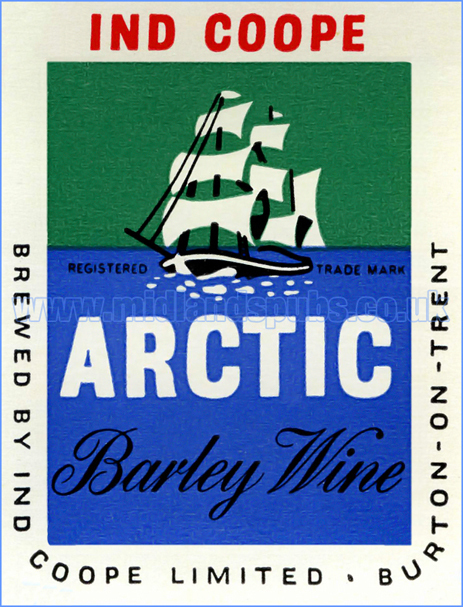 Merging with Ansell's Brewery and Tetley Walker in 1961, the company became part of Allied Breweries. 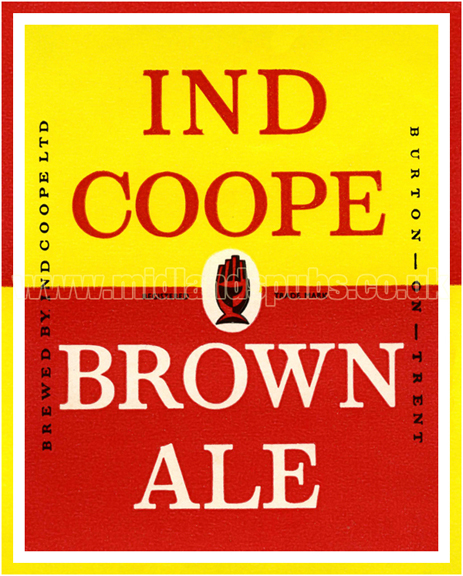 Ind Coope later formed part of the Carlsberg Tetley Group. 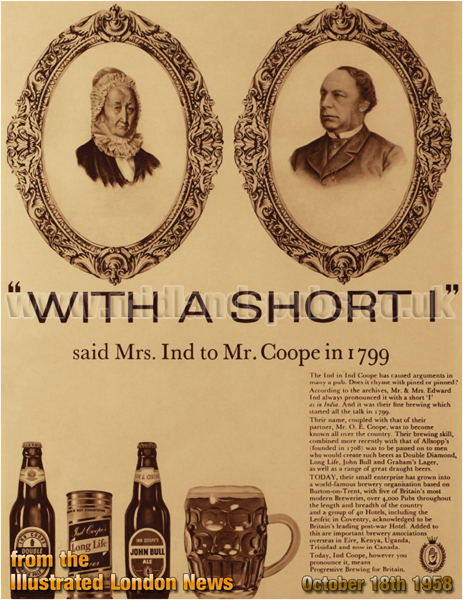 This is an argument that still crops up in pubs today - how to correctly say the name of Ind Coope. Hopefully, this clipping from the London Illustrated News will help to settle the matter. If you have a genealogy story or query regarding Ind Coope Ltd. you can contact me and I will post it here in addition to including your message within the website pages for Staffordshire Genealogy. "The funeral of the late Mr. Martin took place at the cemetery, Burton-on-Trent, on Wednesday afternoon. The deceased gentleman, who was in his 72nd year, was manager of the well-known firm of brewers, Messrs. Ind Coope and Co., for nearly a quarter of a century, and was very much respected in the town. He retired some few years ago, and went to reside at Leamington, where he died on Saturday last. As a testimony of respect to their late worthy manager the above firm decided to close their premises from 11 o'clock for rest of the day, and in consequence of this a large number of the employees decided to follow the procession. The cortege left the station a few minutes after 12 o'clock, there being six mourning coaches and several other mourners on foot, including members of the firm. The hearse was fitted with glass sides and ends, and the coffin lay in full view, upon which was placed nearly a dozen very handsome wreaths, including one from the workmen employed in the firm. After the burial service had been read by the Rev. Mr. Allfree, of Leamington, wreaths of beautiful flowers were placed on the grave. The undertakers were Messrs. J. and H. Hawkins." "Jeremiah Gowars was indicted for stealing five pints of beer, the property of his masters and employers Messrs. Coope, Ind, and Co. of Romford, brewers. Mr. Clifton attended for the prosecution, and Mr. Rawlings for the defence. It appeared that the prisoner had been in the employ of the prosecutors as horse-keeper and night-watchman for several years. On the night of the 11th January 1849, about 12 o'clock, Mr. Beamish, a foreman in the yard, went to the brewery and was unable unlock the outer gates in consequence of a key being left in the lock on the inner side; after knocking the gate for some time he was admitted by Gowars. Beamish observed that the key must have been left in for some purpose, and he proceeded at once into the engine room and there found two men named Packer and Barlow, who were also in the prosecutor's employ, with some beer in a can of a different sort to that which had been given them as their allowance, and in the yard, by the side of a dray loaded with beer, found a can containing beer, and on examining the casks on the dray he discovered the bung of one had been taken out and some beer missing. An investigation took place, and Packer and Barlow were discharged; they soon afterwards gave information to the foreman that it was Gowars who had actually stolen the beer and given it to them, upon which he was apprehended and committed for trial. Mr. Beamish, the two men Packer and Barlow, and other witnesses were examined in support of the charge; they were severally cross-examined by Mr. Rawlings, who afterwards addressed the jury at considerable length. A great number of highly respectable witnesses were called who gave the prisoner an excellent character for honesty. The Chairman summed up, and the jury, after retiring for some time, acquitted the prisoner."" "Mr. E. Ind, of Messrs. Ind, Coope, and Co., brewers, died somewhat suddenly on Saturday evening at his residence in Brentwood. He had been suffering during the week from a severe attack of gout, but fatal termination was not expected." 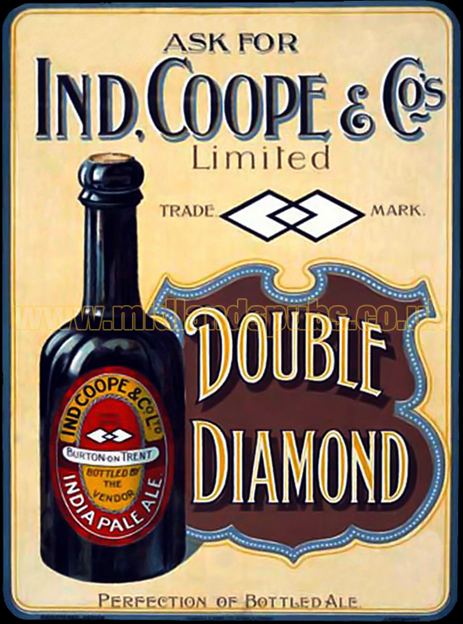 "Death of a Well-Known Brewer"
"The annual general meeting of Ind Coope and Company Ltd. was held Tuesday, at Romford, at the registered offices of the company. The business was purely formal, no statement of accounts being presented, the company's books are in the possession of the receiver and manager, Mr. Arthur F. Whinney, and his statement of affairs in connection with the company is in course of preparation. The Chairman, Sir Thomas Skewes Cox, briefly explained the circumstances which led up to the receivership in January last, and stated that, allowing for the undesirable properties which had been given up, the trade of the company was being well maintained, and the company's free trade in many cases showed considerable improvement. The Chairman also referred to the recent circular sent out by the receiver and manager to the debenture stock holders, in which it was stated that the business was being carried on at a profit. The Chairman mentioned, also, that it was anticipated by the receiver and manager when he presented the accounts of his receivership, they would be followed by an acceptable scheme for the re-organisation of this old-established company. With the re-election of a retiring director, Mr. A. W. Ruggles Brise, and the re-election of the auditors of the company, Messrs. Chatteris, Nichols, and Co., the business of the meeting terminated, with a vote of thanks to the chairman." "Ind Coope and Company Limited"